What do you need for a glamping bridal ensemble besides a plaid shirt and hiking boots? Incredible accessories, of course! When you’re headed to the lake, mountains, or woods, you should style your outfit with stunning hair accessories that vibe with your theme. The trick is to select a design that will be elegant and eye-catching without adding too much formality. So kick back, grab a cup of hot cocoa, and check out our top six suggestions for creating a beautiful camping chic bridal ensemble. 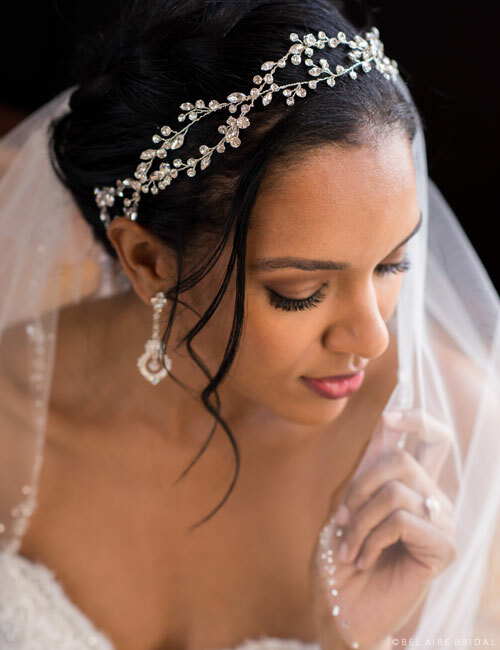 Add understated glamour to your bridal outfit with a metallic leaf headband like 6683. Gold or silver rhinestone-encrusted leaves dress up your hair with stunning shimmer. Beautiful without looking too frilly, this natural design is perfect for the ceremony, reception, and beyond. Want your wedding to have a slightly vintage feel? Style 6687 combines a trio of beautiful antique metal flowers in silver or gold with vintage-inspired rhinestone accents. Bold and wild, this captivating boho-chic design creates an enchanting accent for a woodland wedding. Maybe your idea of a perfect wedding includes a campfire reception and star-gazing. Light up your locks with celestial luminescence wearing twinkly bohemian chain halo 6502. Composed of glittering rhinestones, this design adds beautiful starlit sparkle and will make you feel like you’re over the moon. Flower wreaths aren’t just for garden parties. For a wilt-free design that will last as a romantic keepsake, a fabric flower halo like 6650 is the best way to go! 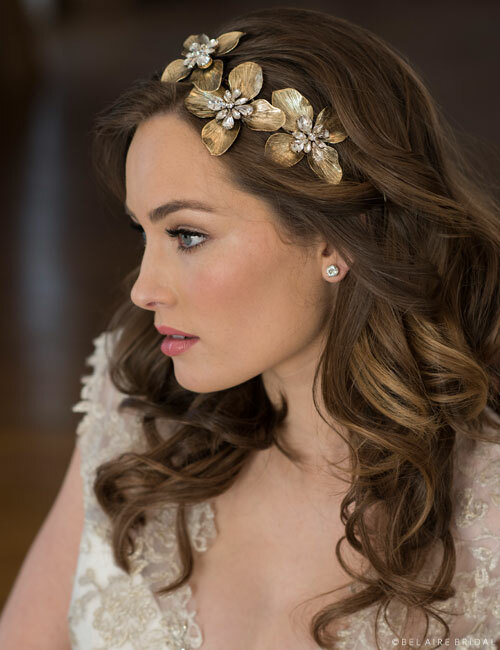 Blooming roses with glittering rhinestone centers and natural-looking leaves create the perfect summer bridal headpiece. Give your ensemble a glamorous twist with a glittering halo like style 6500. 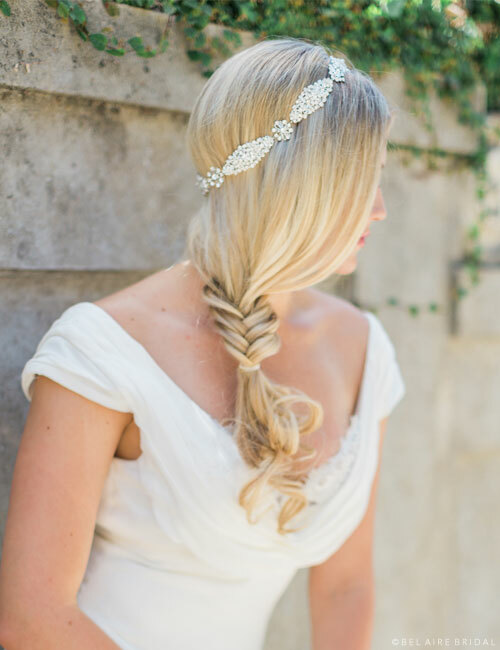 Sparkling rhinestones set in beautiful silver filigree encircle your hair in a modern take on the bridal garland. Wear it with a foldover veil for a romantic ceremony, or style it alone for an eye-catching reception piece. Want to look effortlessly beautiful? For just the lightest suggestion of sparkle, flexible vine 6642 is the perfect choice. Winding metallic vines with delicate rhinestone sprays make you look like you’re wearing shimmering dewdrops in your hair. This whimsical design ties in the back on organza. Are you planning a woodland, glamping, or camping chic wedding? Follow us on Instagram for bridal styling options, and check out our Pinterest boards for ideas! Want to see more gorgeous accessories? Feel free to browse our My Bridal Style: Bohemian and Fall 2016 Collection pages to find the perfect finishing touch.